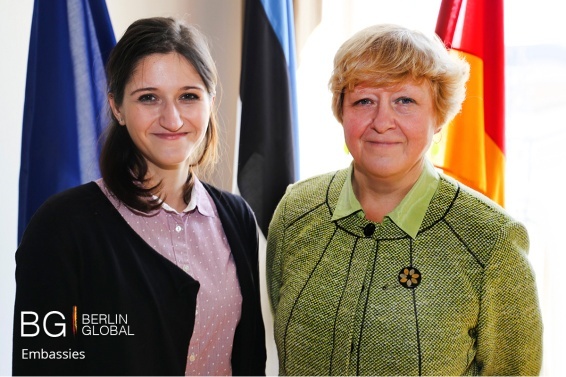 On Wednesday 16th of March a team from Berlin Global visited the Estonian Embassy on Hildebrandstraße 5, in order to conduct an interview with the honorable Ambassador and get an insight into the projects and aims of the embassy. The Republic of Estonia is a parliamentary democracy and after many years under Soviet occupation, the constitution of Estonia came into force in 1992. The head of state is currently President Toomas Hendrick Ilves who has held this post since august 2011. Since 2004 Estonia has been a member of the European Union and security integration group NATO and additionally Estonia has been using the Euro as its official currency since 2011. The Honorable Ambassador Kaja Tael was appointed as the Estonian Ambassador to Germany on 12th September 2012. Ms Kaja Tael studied Estonian philology at Tartu University and afterwards she earned her PhD in Estonian philology. Her career began in the Estonian Institute in 1991, where she worked as the director. Tael’s next position was counselor to President Lennart Meri. Tael’s diplomatic career began in Great Britain, where she was appointed as Ambassador but since 2012 she has been part of the diplomatic corps in Berlin. Her Excellency Ambassador Tael answered questions, which considered aspects of political affairs in Estonia, cultural diplomacy and also one’s related to her personal experiences. The first two questions focused on Ambassador Tael’s studies in Estonian philology and what influenced her to enter into the field of political affairs. Ms Tael considered this question as interesting but complicated to find a precise answer to. The Ambassador explained, that she was born in occupied Estonia, where the job opportunities were limited. Thus she was interested in diplomacy; this area was not allowed to be studied and totally prohibited from working in. Ms Tael was interested also in studying Estonian language, which according to her, has no sense for diplomacy but was something she had a passion for. During her political career, Ms Tael has been Ambassador to Great Britain and Northern Ireland as well as the Undersecretary to the Foreign Ministry for European Affairs. When asked about which type of position she felt she gained the most satisfaction from, she answered that there are some differences between being Ambassador and being Undersecretary. Working in a capital city means more administrative work, but still this can shape diplomacy in many senses. Ambassador Tael described the relationship between Germany and Estonia and who can be a strategic partner for current issues. She maintained, that foreign policy needs to be a continuation of domestic policy. For small countries, such as Estonia, it was crucial to seek membership to the EU and integrate, Estonia was and still is aware not to stay alone. 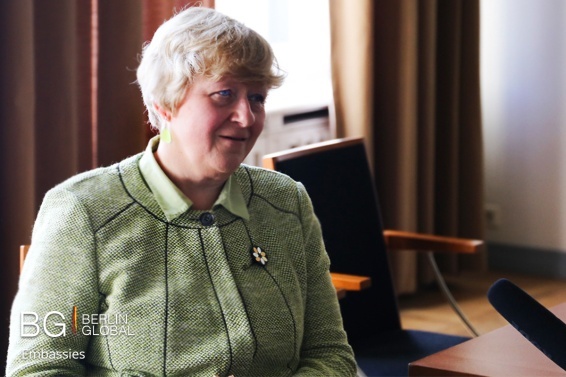 The Ambassador continued that Estonia’s intention was to build strong security cooperation and this aim is still noticeable in both its domestic and foreign policy, especially after Russia infringed international agreements. Ms Tael thought that Estonia is a credible partner for solving many problems in the EU for instance the refugee crisis. The last question addressed to the Ambassador was focused on cultural aspects and how the Estonian Embassy in Berlin is promoting the culture of Estonia in Germany. Ms Tael commented that the events and programs have changed over the years and are focused on different occasions. Last year the focus was on celebrating Estonian artists and this year the program is dedicated to maritime culture. It is an interesting opportunity to interconnect business and cultural diplomacy. The Estonian Embassy also hosts a number of exhibitions, currently on display is a photographic exhibition about Romany culture in Estonia. The Honorable Ambassador Kaja Tael closed the discussion with the hope, that people will spread their own culture because that is the point of how the world is she said.